At first glance, Mobile Business Intelligence (BI) seems a little like those cute cat videos on YouTube. Or those pervasive Puddy Tat pics on Instagram. Yeah, they grab your attention, but what’s the point? Is that cat really going to use that beret, or is it just for show and tell – all hype and no substance? 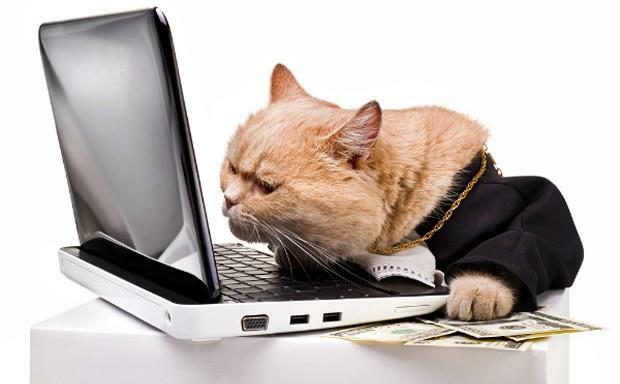 Is the allure of Mobile BI all talk and no action, simply leaving a trail of disgruntled people and cats in its wake? No. Apparently not. Recent research has shown that Mobile BI is now perceived as a more ‘critical’ functional capability then ever before, with initial industry hype transitioning into implementation plans and real action. Dresner Advisory Services’ (DAS) latest (November 2012) Mobile Business Intelligence Market Study found that 61% of respondent organizations considered Mobile BI a “critical” or “very important” analytical capability, compared to 52% in the inaugural 2010 study. The report also revealed that organizations have aggressive implementation plans through 2015 – signaling the intent to transform mere interest into action, with more than half expecting over 41% of their BI users to have access to Mobile BI within 36 months. Nearly 40% of survey participants expected that over 40% of all users would access BI exclusively through mobile devices by 2014. The implications of the study are far reaching, with responses indicating that Mobile BI is no longer just an added feature, or ‘nice to have’ option. So whilst repeatedly watching that video of the piano playing cat is one of the potential functions your mobile device can satisfy, Mobile BI is a capability that can add tremendous value to your phone or tablet. Because Mobile BI is becoming quintessential to any business practice, it’s no surprise that it’s being so heavily pursued across a variety of sectors. Retail: Currently 18% of organizations in the retail industry utilize Mobile BI. This is expected to jump to 55% – a 37% increase – by 2015. Utilities: Currently 29% of organizations in the utilities industry utilize Mobile BI. This is expected to jump to 65%, a 36% increase, by 2015. Education: Currently 16% of organizations in the education industry utilize Mobile BI. This is expected to jump to 56% – a 40% increase – by 2015. Government / Public Sector: Currently 20% of organizations in the public sector utilize Mobile BI. This is expected to jump to 55% – a 35% increase – by 2015. Healthcare: Currently 16% of organizations in the healthcare industry utilize Mobile BI. This is expected to jump to 56% – a 40% increase – by 2015. 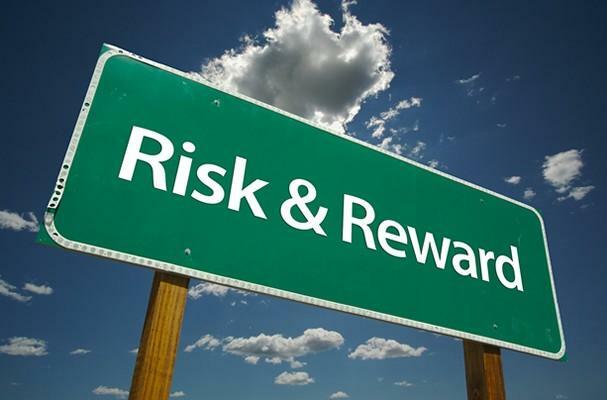 Insurance: Currently 19% of organizations in the insurance industry utilize Mobile BI. 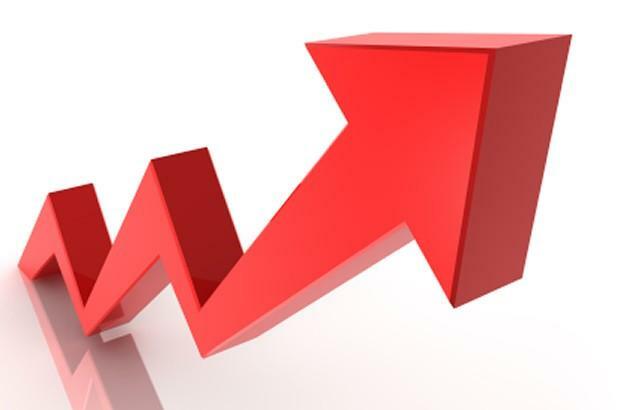 This is expected to jump to 64% – a 45% increase – by 2015. Manufacturing: Currently 30% of organizations in the manufacturing industry utilize Mobile BI. This is expected to jump to 67% – a 37% increase – by 2015. Media: Currently 22% of organizations in the media industry utilize Mobile BI. This is expected to jump to 63% – a 41% increase – by 2015. Retail Banking: Currently 20% of organizations in the retail banking industry utilize Mobile BI. This is expected to jump to 64% – a 44% increase – by 2015. Whether you work in retail or education, healthcare or manufacturing, the applications of Mobile BI are becoming ever more valuable to your industry. The growth in Mobile BI adoption is somewhat stable across regions, with Europe currently leading the charge (23%), narrowly followed by the US (22%). The mobile adoption rate in Asia Pac currently sits at a modest 10%. But, an enormous opportunity presents itself within the region. With continual improvements in infrastructure and embracement of mobile devices, the conditions are well suited for any firm in Asia Pac to implement Mobile BI. MENA has a 17% Mobile BI adoption rate. By job function, there’s a very clear and obvious trend emerging in Mobile BI adoption and usage. A recent research report developed by research and advisory firm Aberdeen Group, entitled Decisions on the Move: Mobile BI 2013 and based on an online survey of 300 organizations spread across the globe in March this year, found that sales teams are the primary adopters of Mobile BI – across geography and industry. In fact, two-thirds of current adopters are sales workers. The report went on to reveal that 52% of businesses consider accessing BI from mobile devices to be a distinct competitive advantage. Forty-three percent of organizations listed the fact that they felt field staff lacked the information necessary to interact with customers effectively on-the-move as the diving force behind Mobile BI implementation. A further 27% of respondents cited the desire to increase employee productivity as the primary reason underpinning Mobile BI deployment. Development over the past decade has led to sweeping changes in the mobile arena. A phone is no longer a mere phone, a tablet is no longer functionless and without identity. No longer are these mobile devices just a more convenient way to check your emails and watch YouTube videos. Mobile devices are portable computers that are making laptops and other traditional devices increasingly irrelevant. These devices are becoming increasingly cheaper, more powerful and more user friendly simultaneously, opening up all kinds of interesting opportunities for users. And it’s not just mobile devices that are becoming more consumable and financially attainable. BI, and enterprise software of all types, is following suit too, making real productivity and actionable insights on-the-go a reality. These improvements in mobility have two main implications for businesses. Firstly, Mobile BI is no longer for the sole use of the IT savvy individuals with coding backgrounds. A degree in computer science is no longer a prerequisite to use these new technologies effectively. Secondly, firms with abundant resources are no longer the only players in the Mobile BI field. An ever-increasing number of small to medium size firms are now incorporating Mobile BI into their business ecosystems in order to attain a competitive edge. 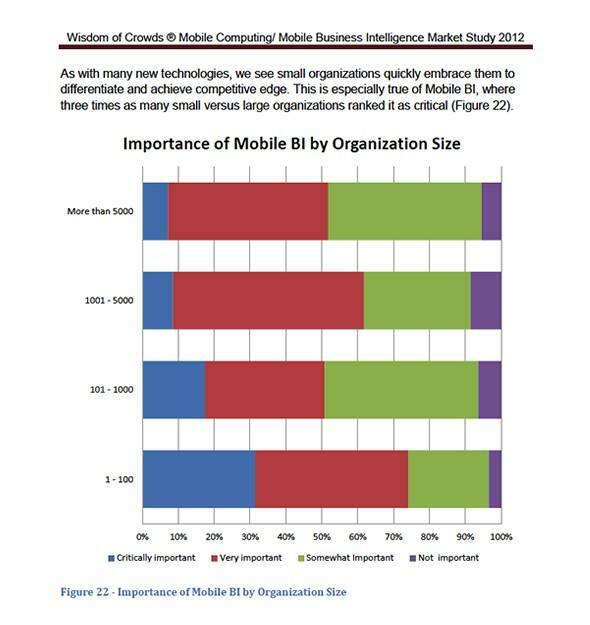 This willingness of smaller organizations to embrace Mobile BI was noted in DAS’ aforementioned study. The research report found that 32% of small organizations (1 – 100 employees) ranked Mobile BI as “critically important”, while just eight percent of large organizations (5000 + employees) viewed mobile reporting and analytics as a ‘critical’ competency. Larger organizations still recognize the significance of Mobile BI, with the vast majority of respondents classifying it as either “critically important” or “very important”. Game changer or deal breaker? So, is the Mobile BI phenomenon a true innovation in deriving business insights, or merely another business fad? As traditional methods of attaining insights become increasingly outdated, and the landscape evolves towards mobile enabled devices, Mobile BI has emerged as the obvious solution. Change doesn’t have to be scary or intimidating. It can be an opportunity to further businesses’ efficiency. As 52% of businesses have already acknowledged, in Aberdeen’s abovementioned research study, accessing BI from mobile devices provides a distinct advantage. Of course questioning new technologies is the job of any person in a position of authority. However, to turn the other way in the face of real change can, and has been, the difference between successful and unsuccessful organizations. After all, even PCs were once deemed not-so-critical – as Ken Olsen, founder of DEC, stated: “There is no reason anyone would want a computer in their home”. Mobile BI has existed for over 10 years, but until recently, its usefulness has gone unheralded. However, with improvements in BI software, handheld devices, infrastructure, as well as changes in business cultures and working habits, there has been no time like the present to deploy Mobile BI.